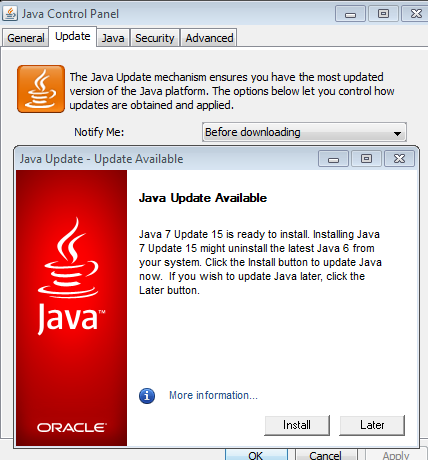 Oracle released today Java 7 update 15, which fixes an additional five vulnerabilities (three critical) compared to the initial Java February Critical Patch Update (CPU). On February, 1 Oracle had anticipated the release of Java 7 update 13, that was originally planned for today, to address vulnerabilities that were being attacked in the wild. Java 6 was also released and is now at update 41. Apple has released APPLE-SA-2013-02-19-1 that patches Java 6 for Mac OS X. While Apple does maintain Java 6 for the Mac, Java 7 is maintained directly by Oracle and Mac users need to go to Oracle to install Java 7. Oracle has scheduled the next update for April 16, in addition to the original schedules of June and October 2013.